My colleagues and I in the West Point Band recently completed our recording project. 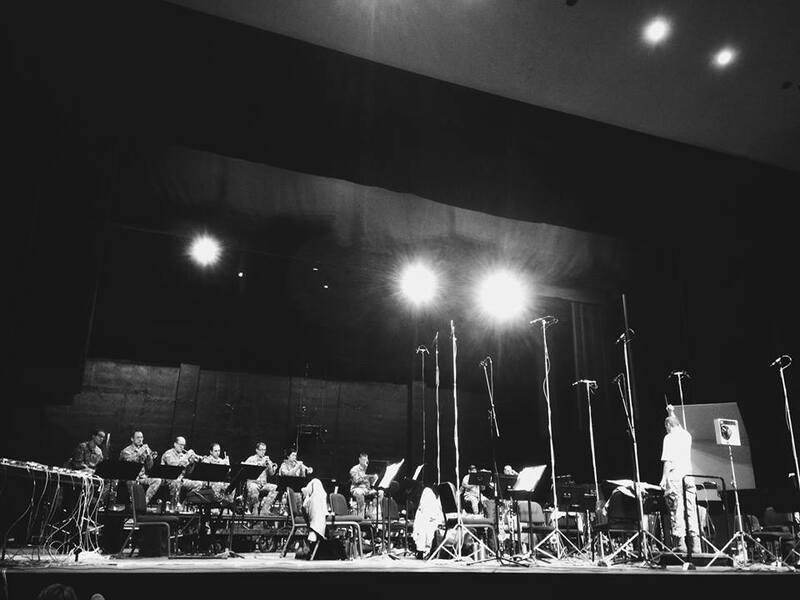 The Concert Band spent five days in Ike Hall recording. The Hellcats also joined us for several tunes, adding an historic and authentic touch that only bugles and drums could achieve. We recorded a vast collection of marches, including the Army’s division songs. With the help of coffee, I was able to keep my focus mentally. The physical aspect was a bit more of a challenge. I won’t sugarcoat things; it wasn’t easy. (You might recall from an earlier post on this blog how challenging marches can be for a brass player.) By nature, recordings are also taxing. Thus, a recording of marches was a terrifying prospect! Think of it as running a marathon interspersed with inhuman amounts of push-ups and sit-ups. But I made it. Part of what made the process demanding was also what made it rewarding: we operated mostly with complete takes. Let me explain. My previous experiences with recordings were done mostly in “chunks.” We’d do one section—say 20 measures—and record that one section over and over until it was acceptable. Then we’d move on to the next 20 measures, as many times as necessary. And so on. These chunks were then patched together by the recording engineers. This time around, we’d record the entire tune. If we needed more, we recorded it down again. This isn’t to say that we didn’t do the occasional patch, but there were far fewer chunks and a lot more complete run-throughs. It was tough on my chops, but those complete takes preserve the spontaneity and make for a more musical product. I can’t wait to hear it. My face did get some relief on the fourth day, however. I mentioned that we recorded the Army’s division songs. Like any other song, they have words. Who sang the lyrics? My colleagues and I! For an entire morning, there were long stretches where my trombone was set down and I rediscovered my vocals for the first time since college. It was great fun making music in a fresh, new manner. The brass section plays during a recording session at Ike Hall. An added bonus: we also recorded a bunch of versions of our National Anthem. Our second day of the project coincided with the opening ceremonies of the Olympics. Each time we played The Star-Spangled Banner, I summoned my inner patriot and imagined the Americans on the podium after winning gold. Now we’re done. All of our takes are in the bag. It’s up to the engineers to work their magic. It should be a terrific finished product! This is without a doubt the most I’ve anticipated one of our recordings. Keep in touch with the band on social media for more updates!